Gum problems can be caused by the accumulation of plaque. 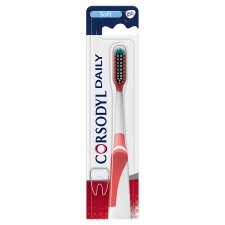 Corsodyl Daily Toothbrush helps remove plaque with soft bristles which are designed to be gentle on the gums. Small head, with dual length bristles, for ease of cleaning. Soft tongue cleaner on the back of the head. Brush teeth as normal. To clean the tongue, use the cleaning grooves on the back of the brush head, move the grooves backwards and forwards over the tongue surface. 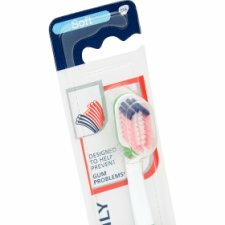 Ergonomically shaped handled - designed to help provide a secure hold when brushing your teeth. Corsodyl toothpaste and Corodyl Daily mouthwash are also available to support your oral care routine. Choking hazard if placed too far back into the mouth.